The NWHL’s playoffs are here and they’re set to be awesome. All four teams are in contention to lift the Isobel Cup. Here’s your preview this weekend’s semi-final. Each match-up is one game only so each team will have to play the best game they can to progress to the final. The second and third seeded Pride and Beauts meet for the first time in a semi-final, having been finalists and winners in both previous NWHL seasons. The Beauts have the strongest regular season record, having gone 12-4-0 compared to the Pride’s 4-8-4 record, although in a one game shootout, regular season form doesn’t necessarily mean much. The Pride have a point to prove, having topped the league in both 2016 and 2017, to finish third with half the points of their opposition hurts. Expect three-time all-star Brittany Ott to tend goal for the Pride, while leading goalscorers Jillian Dempsey, Emily Field and Sydney Daniels will be ones to watch. Current cup holders Buffalo are hoping to be the first NWHL team to successfully defend the title, keep an eye on Corinne Buie and Shiann Darkangelo for goals aplenty. Sunday’s game sees the top seeded Riveters host the Whale, a team that won just three games in the regular season. The Rivs on the other hand lost just three games, so this tilt, on paper looks a little one-sided. Maddie Packer, Alexa Gruschow and Rebecca Russo have been on top form this season for the Rivs and Katie Fitzgerald has been solid in net. 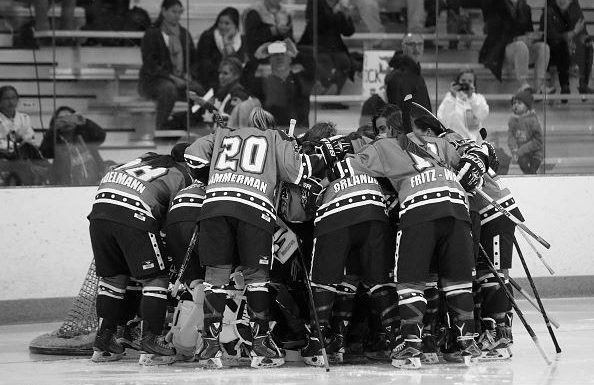 The two teams met five times during the regular season, and the top seeded Riveters won all five games. The Whale are relying on Emily Fluke and Kelly Babstock to find twine but goals have been hard to come by for the team that finished up with a -29 goal differential. Still, playoff hockey is not regular season hockey so none of the four teams can be ruled out at this point. Of course the odds are slim that the Whale progress but the Rivs aren’t invincible and if Connecticut can control the puck, we may see a repeat of some of the close games this season gave us. Where can I see the games? If you can’t get to Buffalo or Newark, the games will be streamed live on Twitter.